A few hundred years ago, in Lumbini, Nepal, a child was born – Siddhartha Gautama. He was born to a royal family, and he was the prince. One day, he persuaded his father to let him beyond the walls of the castle, and to allow Siddhartha to explore the city. Legend has it, that fateful day, he stumbled across a sick man, an old man, and a rotting corpse. Only at this pivotal point does he discover his “fundamental truths of life”- that men born must die, sickness comes to everyone, and old age comes to everyone. As a result, Siddhartha leaves his luxurious life behind and begins looking for the meaning of true salvation, life, and morals. He asks many men about this matter, b ut to no avail. Their answers do not satisfy Siddhartha, for they do not fully answer his many questions. Now at age 35, Siddhartha settles underneath a tree to meditate and to ponder. Here, he is tempted and annoyed by demons, but Siddhartha’s willpower resists. By doing so, he reaches enlightenment, or higher spiritual knowledge. 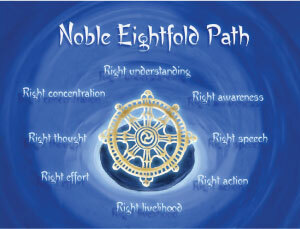 At this point, he becomes known as Buddha, and he decides to spread his spiritual knowledge of the Four Noble Truths, the Noble Eightfold Path( right understanding, right awareness, right speech, right action, right livelihood, right effort, right thought, and right concentration), and much more. At Sarnath, he begins to preach, thus giving his first sermon. He teaches his learnings for the rest of his years, and, upon death, attains Nirvana- the place of peace for Buddhism.